ECG-gated multislice CT provides a cost-effective, non-invasive technology for evaluation of the coronary arteries, as well as for additional clinical applications, which require morphological assessment of the heart and adjacent structures with simultaneous evaluation of the coronary circulation. The excellent negative predictive value of a normal coronary CTA (cCTA) examination excludes the presence of significant coronary disease in the symptomatic patient. Triple rule-out studies provide evaluation of the aorta and pulmonary arteries without loss of image quality in the coronary circulation. The ability to visualize surrounding vascular structures along with the coronary arteries is essential in the evaluation of coronary anomalies. Cardiac CTA is useful in non-coronary applications, including evaluation of the thoracic aorta, cardiac valves and other aspects of cardiac morphology that may require surgical or percutaneous repair. Although radiation exposure is a limitation of cCTA relative to echocardiography and MRI, recent technological advances allow coronary imaging with effective doses as low as 1 mSv. Recent advances in evaluation of coronary plaque morphology as well as myocardial perfusion will allow a more complete noninvasive cardiac assessment in the future and may provide a highly effective method of cardiac risk stratification to facilitate preventive cardiac care. The advent of multislice CT technology with ECG-gating along with innovations in x-ray tube and CT detector technology have resulted in revolutionary progress in cardiac imaging. ECG-gated CT angiography with 64+ slice systems has demonstrated efficacy for the diagnosis of coronary disease, cardiac morphology, and valvular assessment. Recent studies suggest additional applications of CT for assessment of myocardial perfusion and cardiac event risk. Among the clinical applications of cardiac CT, coronary CT angiography (cCTA) remains the most widespread and most controversial. Numerous studies suggest that cCTA is a cost-effective alternative to the nuclear stress test and diagnostic cardiac catheterization. 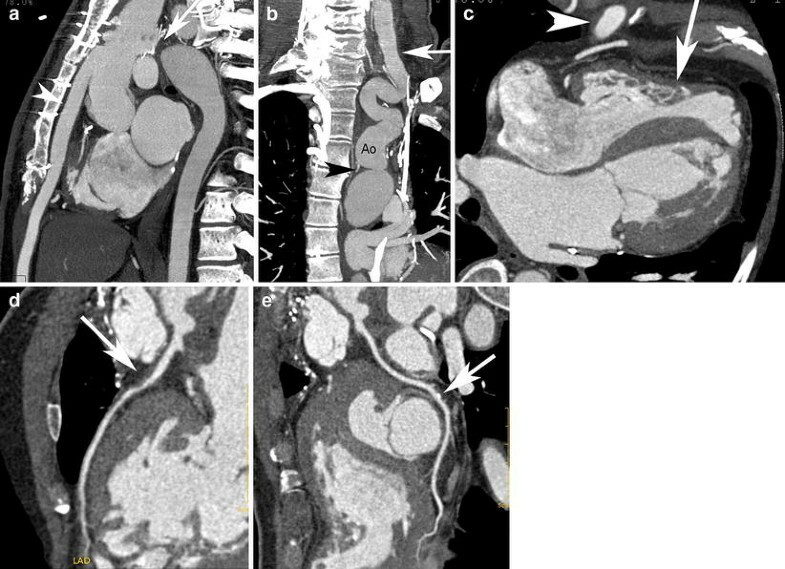 Although CT angiography has replaced conventional arteriography for most visceral applications, issues related to radiation exposure and functional versus anatomical information have been raised as objections to widespread adoption of cCTA. Recent advances in CT imaging methodology and CT image reconstruction algorithms address many of these concerns. 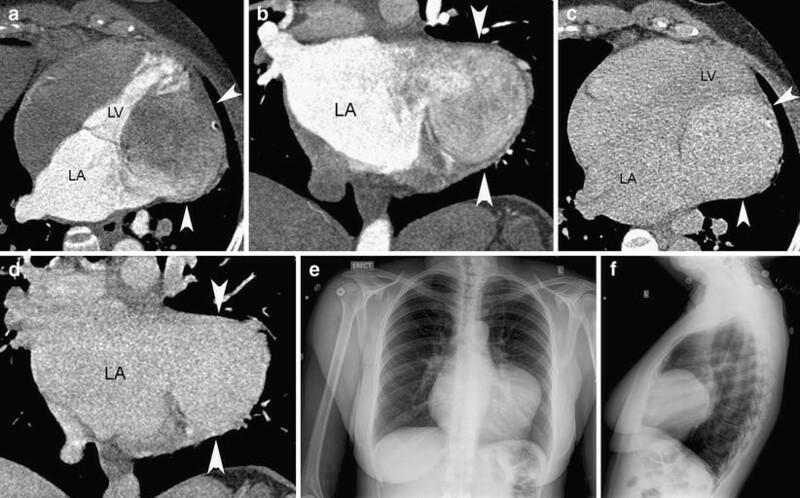 This review explores a variety of clinical applications of cardiac CT. The primary focus is on cCTA with a review diagnostic accuracy, appropriate clinical indications and limitations for evaluation of the coronary arteries. Although the principle indication for cardiac CT is most often for evaluation the coronary arteries, cCTA is often requested for the dual purposes of non-coronary and coronary evaluation. Several of the more common non-coronary applications are reviewed, although a complete review of these applications is beyond the scope of this pictoral essay. Despite clinical advances in diagnosis and treatment, heart disease remains the leading cause of death for both men and women, and is responsible for 26% of all deaths in the United States . Atherosclerotic disease of the coronary arteries remains the most important etiology of heart disease. Coronary computed tomographic angiography (cCTA) provides a non-invasive alternative to cardiac catheterization for direct visualization of coronary anatomy (Fig. 1). Recent meta-analyses of cCTA studies have demonstrated high sensitivity (96–99%) and specificity (88–91%) for the anatomic presence of CAD [2–5]. Although functional information about wall motion can be obtained during cCTA, the primary utility of cCTA is for imaging of the coronary arteries to define the presence of CAD (Figs. 2, 3, 4). The high sensitivity of cCTA for CAD results in an extremely high negative predictive value, especially in patients with low to intermediate risk of coronary disease. A negative cCTA study in this population effectively excludes the diagnosis of CAD. 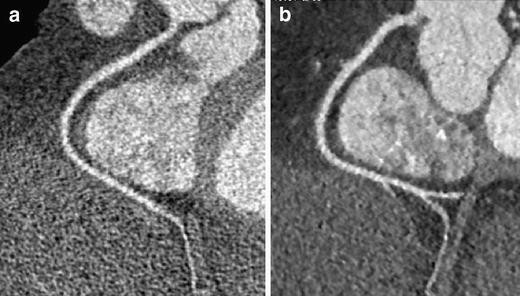 Although the specificity of cCTA is limited by arterial calcification, post-processing techniques using vessel tracking and curved multiplanar reconstructions are often useful for evaluation of calcified vessels (Fig. 5). Nonetheless, blooming artifact associated with densely calcified plaque may preclude visualization of the underlying vascular lumen in the absence of significant stenosis (Fig. 6). Whereas cCTA provides an anatomic depiction of coronary stenosis, stress testing provides additional information to predict the functional relevance of coronary stenosis [6, 7]. When cCTA demonstrates no more than minimal disease of the coronary arteries or when cCTA demonstrates the presence of high-grade coronary stenosis, the clinical implication is clear. When cCTA demonstrates coronary stenosis of uncertain hemodynamic significance, a stress test may be useful to evaluate the functional/clinical significance of CAD found by cCTA. This difficulty in defining a “clinically relevant” stenosis is also a limitation of the “gold standard” conventional arteriography, which demonstrates the degree of luminal narrowing and can provide measurements of pressure gradients but does truly evaluate the impact of coronary stenosis on myocardial perfusion. In the setting of moderate CAD, cCTA and stress testing may provide complementary information for the evaluation of CAD . A recently published decision analytic model for evaluation of the symptomatic patient with chest pain demonstrates how cCTA may be used to improve diagnostic accuracy, reduce the effective radiation dose and limit overall imaging costs for the evaluation of CAD . A workup strategy that employs stress ECG or stress echocardiography prior to cCTA minimizes effective radiation exposure compared to all other strategies that use cCTA and/or nuclear perfusion scanning. When the pre-test probability of CAD is below 10%, a strategy that employs stress echocardiography followed by cCTA before proceeding to cardiac catheterization will result in an effective radiation dose that is lower than a strategy that uses stress echocardiography followed by conventional cardiac catheterization. Imaging costs are minimized by a strategy that employs stress ECG or stress echocardiography with follow-up by cCTA for positive stress tests, as the cCTA can identify false-positive stress tests and eliminate many negative diagnostic cardiac catheterization procedures. The most appropriate testing strategy for the workup of symptomatic CAD depends upon the pre-test probability of disease, which should be estimated on the basis of demographics and clinical presentation . The symptomatic patient with a high pre-test probability of CAD (>50%) may benefit from direct triage to cardiac catheterization. For the patient with a low pre-test probability of disease (≤20%), the combinations of stress ECG + cCTA or stress echocardiography + cCTA provides optimal options as judged by cost and radiation dose, while stress echocardiography + cCTA will result in the lowest rate of negative cardiac catheterization. As the pre-test probability of CAD is increased above 20%, cCTA alone may be a more appropriate option for the diagnostic workup in order to avoid a large number of false-negative test results that are associated with stress testing . Based upon the high negative predictive value, ready availability and rapid diagnostic time of cCTA for the exclusion of coronary disease, cCTA has been proved to be a cost-effective examination for evaluation of low to intermediate risk patients with suspected acute coronary syndrome presenting to the emergency department [11, 12]. cCTA examinations are usually performed as a dedicated study of the coronary arteries, tailored to image the coronary arteries with a minimum dose of iodinated contrast and radiation exposure. However, in the setting of a patient who presents with acute chest pain, the differential diagnosis often includes other potentially life-threatening processes such as pulmonary embolism and aortic dissection. 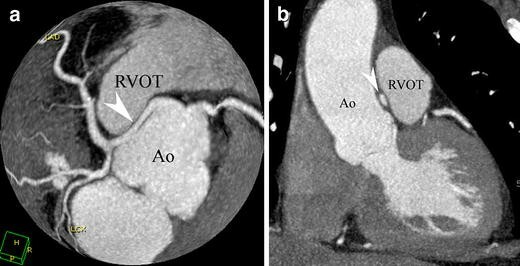 A dedicated cCTA will not include the aortic arch. Furthermore, contrast injection for a dedicated cCTA is usually timed with a saline bolus to wash out the right heart during imaging. In order to optimize imaging of the coronary arteries, thoracic aorta and pulmonary arteries, a triple rule-out protocol may be applied . When performed with proper attention to technique, the triple rule-out study provides excellent opacification of the aorta and pulmonary arteries without loss of coronary artery image quality, although there is an increased radiation dose proportional to the increased scan length (Fig. 7) . cCTA is currently not recommended for evaluation of asymptomatic patients . Atherosclerotic CAD is highly prevalent in the population of developed countries, and screening for CAD by cCTA is likely to identify many patients with CAD who might not benefit from interventional therapy. Several recent studies have suggested that cCTA may be useful for risk assessment in the asymptomatic population (see below), but this suggestion must be tempered by the potential for overtreatment of anatomical disease, which is found during such “screening cCTA” procedures. A similar problematic situation arises when low-risk asymptomatic patients are referred for cardiac catheterization after a positive stress test in the course of a preoperative or “routine” cardiac evaluation. Such patients may benefit from a “second opinion” cCTA, which may obviate the performance of an unnecessary invasive conventional diagnostic cardiac catheterization . An overwhelming majority of patients presenting with acute coronary syndrome have calcification in the coronary circulation. Several large retrospective studies of asymptomatic patients have demonstrated that the presence of coronary calcium is a predictor of cardiac events  and risk of death [18, 19]. Prospective studies have confirmed these results and demonstrated that coronary calcium scoring provides additional prognostic information beyond standard risk assessment based upon clinical and laboratory tests [20, 21]. Nonetheless, calcium scores are not recommended to evaluate the patient who presents with acute symptoms. Coronary calcium imaging does not detect the presence of non-calcified plaque, and a minority of patients experience coronary events in the absence of coronary calcification (Fig. 2) [22, 23]. A recent meta-analysis of 64-slice MDCT studies included 10 studies with 5,675 patients. After a mean follow-up of 21 months, major adverse cardiac events occurred in 0.5% of patients with normal cCTA, 3.5% of patients with non-obstructive disease on cCTA and 16% of patients with obstructive cCTA (p = 0.0001) . Individual studies have demonstrated an increasing frequency of cardiac events based upon both increasing plaque burden and more proximal location . Although cCTA is not currently recommended for risk stratification, continued advances in plaque characterization by CTA may make risk stratification by cCTA a reality in the future . 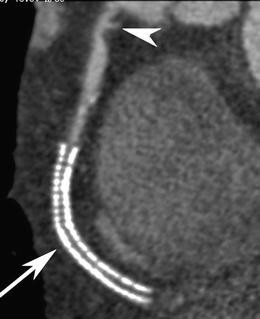 A major limitation of traditional cCTA is the lack of a functional imaging component to gauge whether the coronary stenosis results in myocardial ischemia. The extent of inducible ischemia associated with coronary disease is predictive of the risk of a coronary event as well as the expected benefit of revascularization compared with medical therapy [27, 28]. In order for cCTA to serve as a comprehensive evaluation for coronary disease, the study needs to provide both anatomic and functional information about CAD. Several groups have used CT to perform perfusion imaging either as a stand-alone examination or as part of a cCTA study. A first-pass dynamic evaluation of myocardial perfusion might be the most accurate technique to quantify myocardial perfusion, but such an approach requires repeated scanning of the heart with a relatively high radiation exposure. Several groups have used a single arterial phase to estimate myocardial perfusion based upon myocardial blood pool enhancement during cCTA and a delayed phase to image late enhancement that may be associated with infarcted myocardium . Low-dose scans for late enhancement can provide valuable diagnostic information on the functional significance of coronary artery disease . 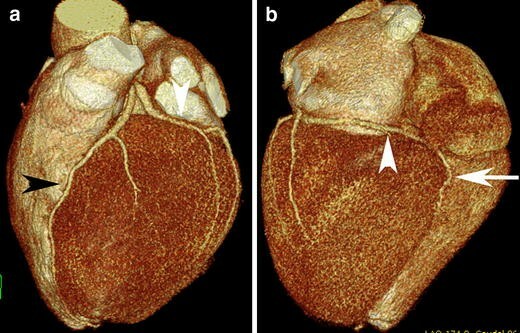 Given the relatively small changes in CT density provided by enhancement of the myocardium with iodinated contrast material, various techniques have been proposed to improve the sensitivity of CT for perfusion imaging. One group has suggested that ischemic myocardium may be recognized by a pattern of subendocardial hypoperfusion during systole with apparent normal perfusion during diastole . Using this technique, they have demonstrated a sensitivity of 90% and specificity of 83% for CT detection of myocardial perfusion defects identified by nuclear perfusion imaging . A more conventional approach to identify ischemic myocardium with CTA uses pharmacologic stress. Given the limited temporal resolution of CT, the tachycardia associated with a dobutamine stress study can result is substantial degradation of image quality. However, adenosine may be used as a vasodilator for CT stress imaging. One group has measured a transmural perfusion ratio during adenosine stress CT (subendocardial attenuation density/subepicardial attenuation density) to detect myocardial perfusion abnormalities with a sensitivity/specificity of 86%/92% on a per-patient analysis . Another group has combined adenosine with first pass stress imaging followed by rest images, and has demonstrated good correlation with SPECT myocardial perfusion imaging for both stress and rest imaging [34, 35]. The combination of cCTA stress imaging with subsequent rest imaging as well as a third scan for delayed enhancement can be performed with an effective radiation exposure similar to that of SPECT imaging (mean 12.7 mSv) . In order to improve the detection of perfusion defects with cCTA, dual-energy CT may be useful. A relatively higher kVp is needed for optimal tissue penetration to optimize coronary imaging, while a lower kVp is useful to improve sensitivity for the detection of small differences in myocardial enhancement. A dual-source scanner may be used to simultaneously provide adequate penetration for coronary cCTA as well as low kVp imaging to improve detection of myocardial perfusion. A low energy “iodine perfusion map” is displayed as a color overlay on the high-resolution coronary CTA image to provide excellent diagnostic correlation with SPECT imaging (sensitivity: 91%, specificity: 92%) . This same group demonstrated cCTA detection of reversible SPECT defects without stress imaging . They have suggested that such defects may be visible without stress imaging because of the superior spatial resolution and dynamic range of CT as compared with nuclear SPECT or secondary to the intrinsic vasodilatory effects of iodinated contrast . cCTA provides clear definition of the anatomic course of the coronary arteries, even when image quality is limited with respect to assessment of coronary stenosis. Although the coronary arteries are clearly visualized by conventional cardiac catheterization, cCTA more clearly demonstrates the relationship between coronary arteries and adjacent anatomical structures such as the pulmonary artery. For this reason, cCTA is an excellent study to demonstrate various coronary anomalies (Figs. 8, 9). cCTA is often superior to conventional arteriography for the diagnosis of coronary variations . cCTA provides a useful roadmap in preoperative planning for bypass surgery as well as in post-surgical assessment. In addition to localizing the site of coronary stenosis, cCTA can be used to assess whether a more distal segment of a coronary vessel is epicardial in location and is accessible for bypass grafting . In the postoperative patient, cCTA can be used to assess the patency of bypass grafts that may be difficult to cannulate by conventional arteriography (Fig. 10). Injury to existing bypass grafts is a major risk of reoperation. cCTA clearly demonstrates the position of bypass grafts relative to other structures and is therefore useful for planning of reoperation bypass procedures . The stable patient with a suspected thoracic aortic injury, dissection or aneurysm is often evaluated with a CT for preoperative planning as well as a cardiac catheterization to assess patency of the coronary arteries. 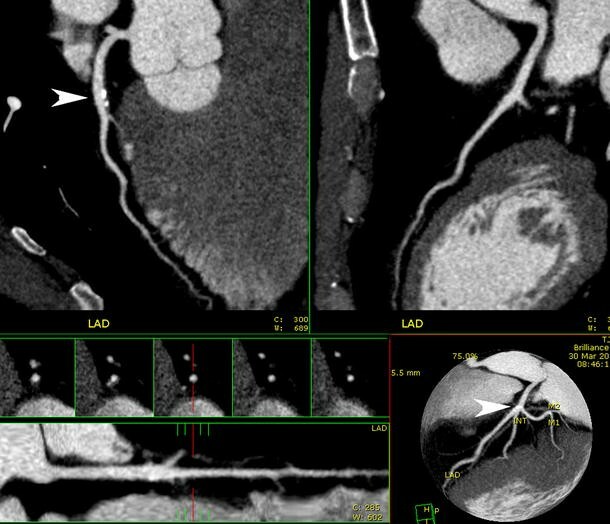 cCTA can provide simultaneous evaluation of pathology in the aorta as well as assessment of the coronary arteries for preoperative planning (Fig. 11). Following repair of an aortic aneurysm, cCTA can provide clear anatomic definition of prosthetic valves, aortic grafts and residual dissection flaps (Fig. 12). cCTA is also useful for evaluation of complex aortic anomalies such as coarctation, interruption of the aortic arch and collateral vascular supply (Fig. 13). Preoperative planning for aortic valve replacement surgery requires assessment of the ascending aorta for morphology and calcification, assessment of the aortic valve annulus for appropriate sizing of the replacement valve and evaluation of the coronary arteries. cCTA is an excellent modality to assess simultaneously the thoracic aorta, the aortic valve and the coronary arteries (Figs. 14, 15). cCTA can provide accurate imaging and measurements of the aortic annulus and valve for preoperative planning of aortic valve replacement . Percutaneous valve replacement procedures are poised to revolutionize the therapy of aortic valve disease . cCTA provides essential information prior to percutaneous valve replacement, especially with respect to the location and extent of aortic root and valve calcifications and the location of the coronary ostia relative to the valve plane . The diagnosis of bicuspid valve is readily apparent on cCTA (Fig. 16), and the presence of aortic valve thickening and insufficiency may also be visible (Fig. 17). When reoperation is required for a prosthetic aortic valve that has failed, coronary angiography is often contraindicated, especially in the setting of endocarditis when catheter angiography carries an increased risk of embolization . cCTA can provide high-resolution functional imaging of prosthetic valves with simultaneous evaluation of the coronary arteries for preoperative planning. Prosthetic endocarditis may also be associated with additional complications including valve malfunction and pseudoaneurysms, which may be clearly defined by cCTA (Fig. 18). MRI is generally considered the test of choice for evaluation of cardiac morphology since this technique does not require ionizing radiation. However, cCTA has been used extensively in preoperative planning for ablation procedures in the left atrium. 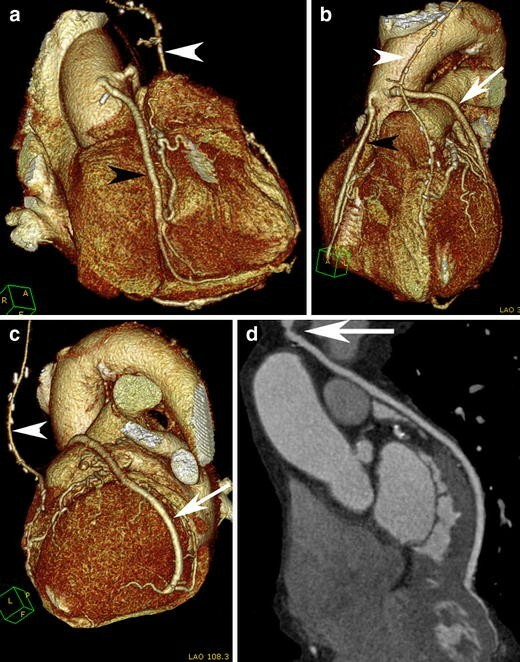 The pulmonary veins and the intricate details of the left atrial anatomy are more clearly visualized by cCTA, which provides superior spatial resolution as compared to MRI, and their location can be mapped into a three-dimensional volume that is used during the ablation procedure (Fig. 19). Integration of CTA image data during ablation in the left atrium is often useful to shorten procedure times and improve patient outcome . Although echocardiography and MRI are generally preferred for evaluation of cardiac morphology, changes in cardiac morphology (Fig. 20) and the presence of mass lesions (Fig. 21) can be evaluated by cCTA. Enlargement of the right heart is often related to intracardiac shunts. cCTA is an excellent test for identification of anomalous pulmonary veins that are not visualized by echocardiography. Furthermore, we have found cCTA to be a useful study in the pre-procedure planning for percutaneous closure of atrial septal defects (Fig. 22) and ventricular septal defects (Fig. 23). The superb three-dimensional anatomical definition provided by CT imaging allows assessment of the size and location of the defect relative to adjacent structures such as the aortic root. Evaluation of the right heart by cCTA is limited by the mixing of opacified blood from the SVC with unopacified blood from the IVC. Nonetheless, with appropriate modifications of the contrast injection protocol, cCTA may be used successfully to evaluate right ventricular morphology, as well as for evaluation of the tricuspid valve (Fig. 24) . Given the development of new low-dose CTA protocols (see below) and the more rapid acquisition time of CTA compared to MRI, it is likely that cCTA will play an increasing role in the evaluation of cardiac morphology and congenital heart disease. As a full discussion of these topics is beyond the scope of this pictoral review, the reader is referred to a recent textbook for more in-depth discussion of these topics . cCTA is a powerful diagnostic tool, but necessitates injection of intravenous contrast material as well as exposure to ionizing radiation. cCTA is often limited by image quality in obese patients as well as patients with elevated or irregular heart rates. The presence of blooming artifact from dense arterial calcification limits the quality of cCTA and results in overestimation of the degree of stenosis (Fig. 6). Evaluation of metallic stents is also limited by blooming artifacts from the stent struts, though cCTA has been increasingly successful for evaluation of coronary stents, especially with stent diameters above 3 mm (Figs. 25, 26). Although a normal cCTA effectively excludes the presence of CAD, the finding of moderate disease by cCTA is often of uncertain clinical significance as it may not be obvious whether the patient’s symptoms are related to the visualized CAD. Because of these limitations, competing technologies for evaluation of suspected CAD—including ECG-stress testing, stress testing with echocardiography, stress testing with nuclear perfusion imaging and MRI—may be more appropriate in specific clinical scenarios. Functional stress testing may be appropriate to evaluate the clinical significance of CAD detected by cCTA. A meta analysis of 147 consecutively published reports of exercise treadmill studies reported a sensitivity of 68% with a specificity of 77% for the detection of CAD . Diagnostic accuracy is somewhat higher for stress echocardiography and stress perfusion imaging, with both of these tests demonstrating superior diagnostic accuracy as compared to the basic ECG stress treadmill test. A pooled analysis of stress tests for the diagnosis of “significant” CAD demonstrated a sensitivity/specificity of 80%/86% for stress echocardiography and 84%/77% for stress perfusion imaging . Although most studies suggest a relatively similar diagnostic accuracy for stress echocardiography and stress perfusion imaging, a recent meta-analysis suggests that stress echocardiography is superior to stress perfusion imaging for evaluation of high risk (left main disease and/or triple vessel) disease because of the greater risk of missing severe CAD with perfusion imaging (sensitivity 75% versus 94%) . Although echocardiography does not provide direct visualization of the coronary arteries, stress ECG combined with echocardiography is a well-established non-invasive examination for stratifying the risk of CAD and influencing the decision for subsequent coronary angiography and revascularization . Based upon the decision analysis cited above, initial evaluation of suspected CAD with stress echocardiography (with cCTA reserved for follow-up of positive stress tests) may be more cost-effective as compared to an initial cCTA for the low risk patient . A minority of cardiac imaging procedures are performed for structural or functional evaluation, unrelated to CAD. For these examinations, echocardiography is a less expensive and less invasive technique compared to cCTA. Transthoracic echocardiography can be performed portably and does not generally require administration of intravenous contrast material. Transesophageal echocardiography can be performed when there is a need for higher spatial resolution or to visualize parts of the heart—such as the left atrial appendage—that may be difficult to image from the transthoracic approach. Echocardiography is superior to CT when the primary objective of diagnostic imaging is for assessment of ventricular wall motion, valve morphology and function, as well as for quantification of flow velocities and pressure gradients within the heart. Doppler evaluation provides a simple method to grade the severity of valvular stenosis or insufficiency, as well as other functional abnormalities such as tamponade and restrictive physiology. Based upon the superior temporal resolution of echocardiography, echocardiography is often superior to cCTA and MRI for detection of mobile masses and vegetations within the heart. MRI is limited by spatial resolution for evaluation of coronary artery branches, but is an excellent modality for evaluation of myocardial function, perfusion and viability [52, 53]. As compared with cCTA, there is no ionizing radiation and no need for a contrast injection to evaluate function with steady-state free-precession sequences. The excellent contrast between the blood pool and the endocardial surface allows clear depiction of cardiac morphology and reproducible measurements of chamber size. When gadolinium is administered, different patterns of myocardial perfusion and delayed enhancement may be used to characterize various types of cardiomypathy and to document the extent of viable tissue. MRI may be combined with pharmacological agents for stress perfusion imaging. The major clinical applications for cardiac MRI at this time include imaging of structural morphology and myocardial evaluation. A major limitation of cCTA compared with stress echocardiography and MRI is the exposure to ionizing radiation. Various strategies have been implemented in order to reduce this exposure. At the level of CT hardware, there is a constant effort to produce more efficient detectors. At the level of image acquisition, newer techniques have been developed that limit exposure to smaller portions of the cardiac cycle. Finally, at the level of image reconstruction, newer technology is being developed to improve signal to noise in CT images with fewer photons in the raw data. Conventional cCTA is performed with an ECG-gated helical image acquisition to reconstruct an image during the quiescent phase of the cardiac cycle, usually in mid-diastole. In order to obtain sufficient data for reconstruction, helical scans are performed with a pitch in the range of 0.2–0.3. This low pitch provides sufficient overlap between successive helical rotations of the detector array such that adequate data are obtained in each portion of the cardiac cycle for image reconstruction. Unfortunately, the low pitch also results in relatively high radiation exposure. The data obtained from the quiescent portion of diastole are used to reconstruct high-resolution images of the coronary arteries, while data obtained from the remainder of the cardiac cycle are used to reconstruct lower resolution functional images that may be used to demonstrate valve motion and ventricular contraction. However, much of the data acquired during the non-quiescent portions of the cardiac cycle is not needed. A technique known as tube-current modulation has been developed to adjust the current to the x-ray tube such that the full dose is delivered during the quiescent phase of the cardiac cycle for high-resolution imaging, while a much reduced dose is delivered in other phases of the cycle to allow reconstruction of lower resolution functional images. At a heart rate of 60 beats per minute, tube current modulation may result in a dose reduction of greater than 50% without loss of image quality . Prospective ECG-gating with an axial “step and shoot” technique has been introduced to further reduce radiation dose. This technique acquires images in axial mode during a single, short (usually mid-diastolic) interval. The entire heart is acquired in one or more axial steps (Fig. 7). The prospective gating technique relies on a stable heart rate to predict the time for mid-diastole and to trigger the x-ray tube only during that interval for imaging. Evaluation of cardiac motion is not possible with standard step-and-shoot acquisition since image data are not obtained during the systolic portion of the cardiac cycle. Furthermore, image quality may be adversely impacted if a variable heart rhythm results in image acquisition during a suboptimal phase of the cardiac cycle. Nonetheless, a recent multicenter international study included 685 patients, with 99 patients evaluated using prospective ECG-gating and 586 patients evaluated with a standard helical approach. Mean radiation dose was reduced by 68%, from 11.2 mSv for the helical mode to 3.6 mSv for the step-and-shoot technique, without loss of image quality . High pitch spiral acquisition is a new variation on helical scan technology that can be used to acquire cCTA of the entire heart in a single spiral acquisition for patients with a sufficiently low heart rate. Rapid table motion is timed so that the entire heart is imaged during the quiescent phase of a single cardiac cycle. A recent study of 100 patients comparing prospective ECG-gating with step-and-shoot technology to prospective ECG-gating with a high pitch spiral mode (pitch 3.4) demonstrated diagnostic image quality in over 98% of coronary artery segments with no significant difference in image quality between the two methods . Mean effective radiation dose was 1.4 ± 0.4 mSv for prospective ECG gating with step-and-shoot technology and 0.9 ± 0.1 mSv for prospective ECG gating with high-pitch spiral mode. Most contemporary CT scanners utilize a mathematical technique called filtered back projection to reconstruct CT images. Iterative reconstruction is another category of techniques that has recently gained popularity for reconstruction of CT images with decreased image noise. Iterative reconstruction techniques employ an initial estimate of voxel attenuation to predict projection data; estimates of voxel attenuation are iteratively adjusted to minimize the difference between the predicted projection data and the measured projection data. These techniques are more computationally intensive as compared to filtered back projection, but can result in reduced image noise; alternatively, iterative techniques may be used to maintain an acceptable signal-to-noise ratio and image quality with reduced radiation (Fig. 27). A recent study suggests that iterative techniques may allow a reduction in effective radiation exposure by approximately 50% . Based upon the doses recorded from studies of prospective ECG-gating and high pitch helical technique, new acquisition techniques combined with iterative reconstruction should routinely provide cCTA imaging with effective radiation exposures of 1 mSv or less. Advances in CT technology over the past decade have resulted in marked improvements in cCTA image quality along with reduction in effective radiation dose. We have reviewed the application of ECG-gated CTA of the heart to various clinical applications, including evaluation of the thoracic aorta, aortic valve, bypass grafts, left atrium and various structural cardiac abnormalities. However, the major indication for cardiac CT is cCTA for evaluation of CAD in symptomatic patients with low to intermediate risk of CAD. High-risk symptomatic patients should be triaged directly to cardiac catheterization. In patients with a risk of CAD below 20%, stress echocardiography may present the most cost-effective study for initial evaluation. cCTA is useful in these patients to follow-up on positive stress tests in order to avoid catheterization of patients with false-positive stress test results. As the pre-test probability of CAD in a symptomatic patient rises above 20%, cCTA provides a cost-effective initial evaluation. 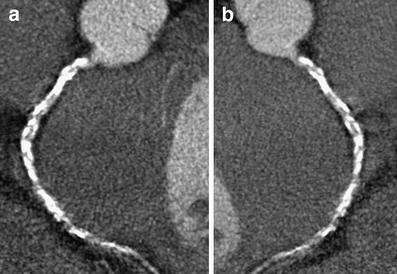 Stress perfusion imaging may be useful as a secondary study in these patients when moderate stenosis (50–75% diameter reduction) is identified on cCTA. 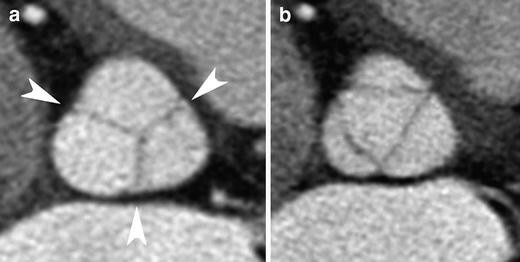 New developments that allow myocardial perfusion imaging with cCTA are likely to result in a single comprehensive CT examination for CAD in the future.